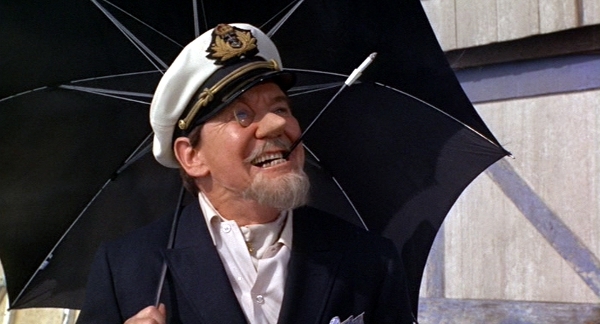 Last week, I wrote 13 QUICK THOUGHTS about just how great Burgess Meredith was as the Penguin — and how I didn’t appreciate him until I was grown. (You can read it here.) The occasion? Meredith’s birthday — he was born 108 years ago and died in 1997. 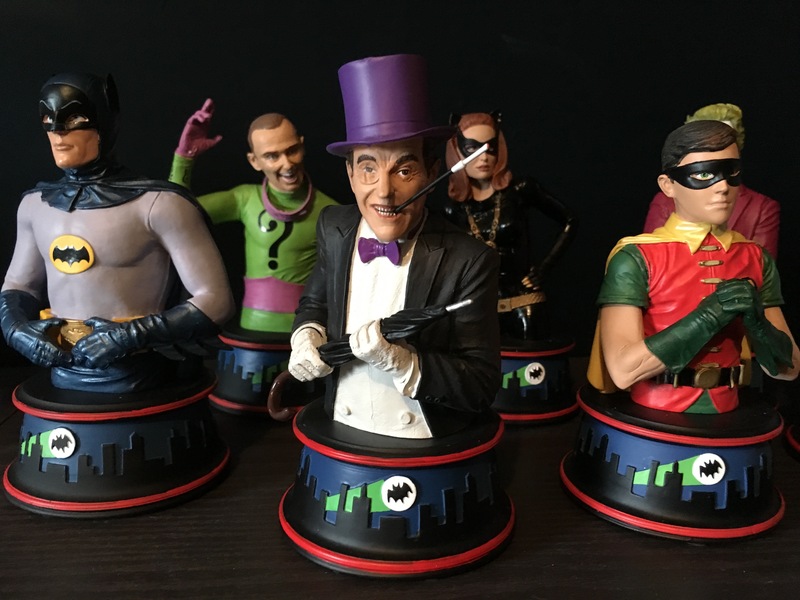 So I figured it made sense to follow that up with Part 6 of BUILDING BATMAN ’66, our look at Diamond Select’s busts and banks, with sculptor Jean St. Jean and Barry Bradfield. Part 5. Batgirl. Click here. Part 6. The Joker. Click here. 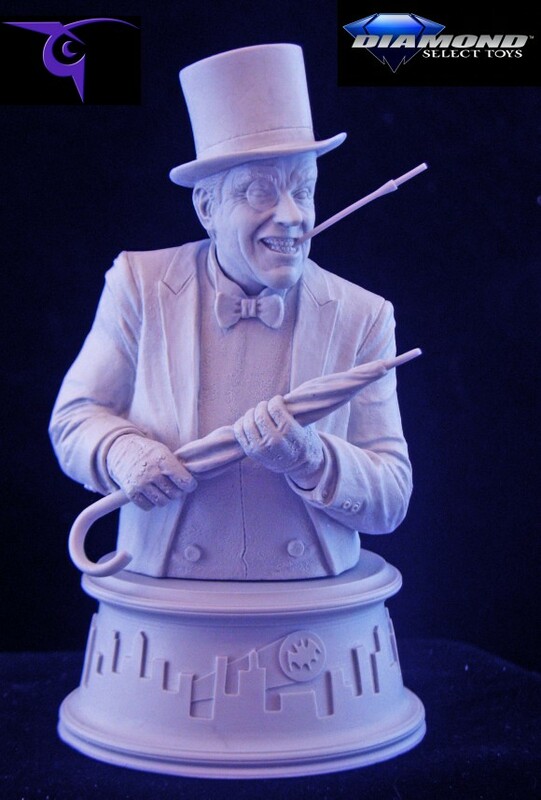 Barry Bradfield: I really like how Burgess Meredith moved as Penguin on the show, and felt that working that into how he would hold his umbrella would be great. You don’t know if he’s going to gas you or lunge at you with it. I really wasn’t sure if we’d be able to include the cigarette holder because of the size and how fragile it might be, but I’m so glad it was able to be executed. It really helps add to his shifted-jaw grimacing smile that really came about with this iteration of the character. 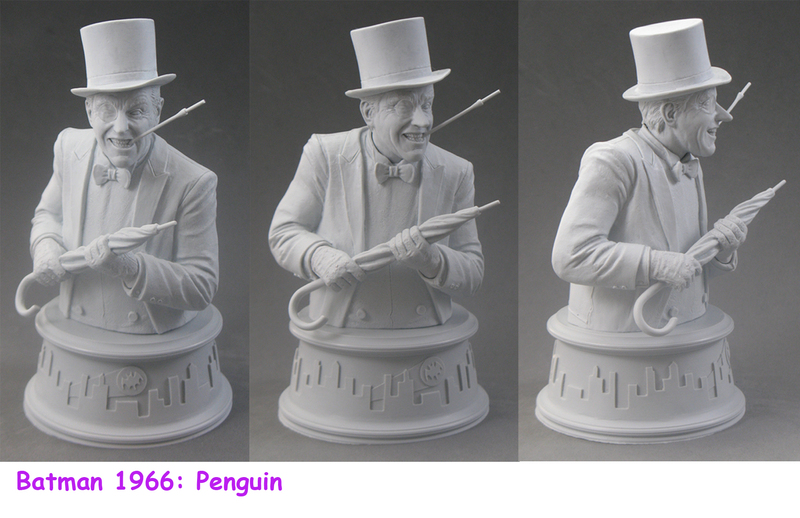 Jean: The Penguin’s umbrella, even in the comics but especially in the TV show, was his signature weapon. It was such a cool, weird choice to disguise as a gun or whatever. Dan: I didn’t care much for the Penguin when I was a kid. Love him now. How about you? Barry: Actually, I didn’t either. I was most excited for Riddler and Catwoman episodes and Penguin ones I often turned off once I had already seen them. 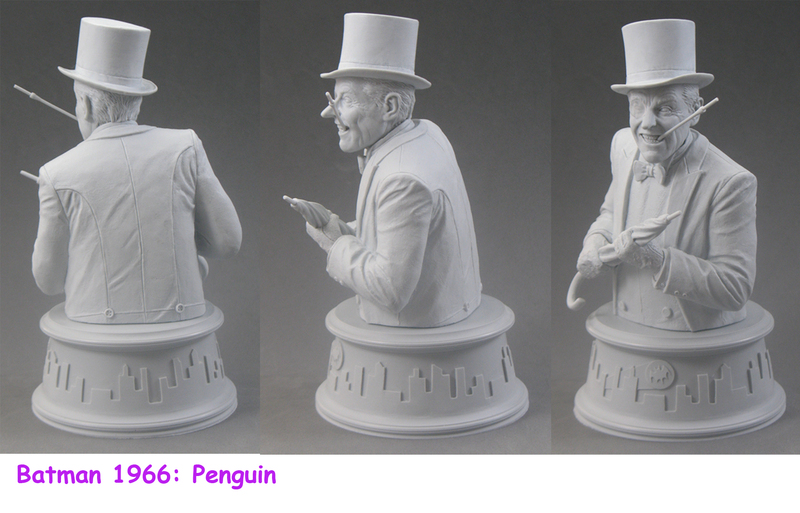 I can only chalk it up to Penguin overload because I started watching the series in the midst of Batman Returns’ popularity, so he was everywhere. As an adult, I absolutely love Meredith’s portrayal of the character. He’s got some great lines and gives a fantastic performance. It really goes to show that this series can be appreciated by different audiences for different reasons. Jean: He wasn’t always my favorite, but I always liked how he was constantly underestimated, kind of the ultimate underdog. Which is your favorite Penguin episode? Jean: The Penguin/ Joker team-up, “The Zodiac Crimes.” The kick-off of a clever three-part story arc teaming up the Clown Prince of Crime and the Felonious Fowl! Barry: The first one I ever saw, which was the first episode of the series I ever saw, was a French-dubbed version of “A Horse Of Another Color.” I had no idea what was going on because my understanding of French was minimal, but I liked seeing Batgirl and Penguin racing horses. I think the movie is my favorite Penguin ‘episode’ because of the whole ruse with him dressed as Commodore Schmidlapp. I also love Penguin’s line, “Every one of them has a mother,” when referring to the dehydrated goons.